Washingtonian Bride & Groom Magazine held their annual Unveiled event a few weeks ago. I had the pleasure of being a part of the fabulous event and it was a thrilling day for me. The event showcased some of the best wedding vendors in the DC-area at the spectacular Mandarin Oriental Hotel. It was such a beautiful event with gorgeous displays from event planners, caterers, florists and more. 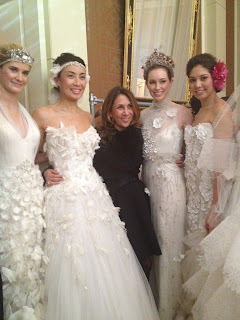 The main event of the day was an amazing fashion show by superstar fashion designer, Reem Acra. The designer creates some of the most beautiful wedding gowns and dresses around. She dresses countless celebrities (including Angelina Jolie, Drew Barrymore and Christina Applegate and many more) for their major red carpet events and appearances and truly has a fashion empire. 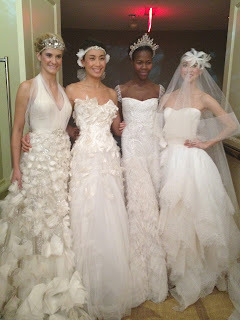 I was so excited to assist bridal makeup guru Carl Ray with the makeup for the fashion show. Carl does makeup for some of the most prominent women and events in DC and is always invited to be a part of this popular Washingtonian Bride & Groom event. He's been on the Washingtonian Bride & Groom Top Vendors list for the past several years and has been named their Top Vote Getter the past two years. He is the most sought after bridal makeup artist in the area and an all-around amazing person! I love working with him on his blog and assisting him for events like this! Reem wanted the makeup look to be bright, fresh, and earthy. The gowns were so glamorous and intricate, she didn't want to take away the focus with the face. Carl and I did flushed, contoured cheeks, just-bitten lips and copper tones with brown liner and tons of mascara for the eyes. Skin was kept dewy and light and brows were darkened to complete the look. It was such an honor to be doing makeup for such a pro and it's amazing to see his work. Brial guru Carl Ray and Reem Acra. Some of the models in their gorgeous gowns. Model practicing her catwalk before the show. 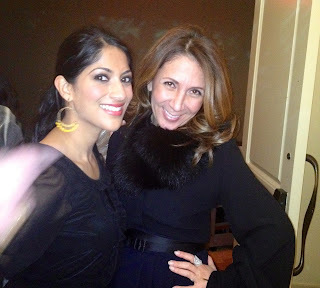 Reem Acra and me after the show! Doing makeup for the lovely models. Carl working his genius makeup skills on one of the models. Reem Acra greeting the crowd after the show. I'm excited to be doing more makeup and can't wait to do more events like this and especially work with more DC brides! 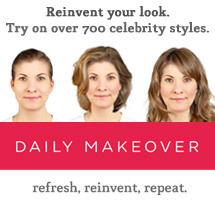 It's ironic that one of the models (the blond on the left)is a home wrecker! Weddings by Anne Perth Florist providing elegant, beautiful and affordable wedding bouquets and flower arrangements. Each bride and groom are unique and we believe your flowers and decor should be too.We will work with you to come up with a theme and design based around your wedding dress, colour palette, atmosphere, location, and season.